Last summer’s Carlton Complex wildfire scarred the land and destroyed homes, but residents are rebuilding, the land is healing and the valley is ready for hikers, bikers and campers. The welcome splendors of spring are cloaking the hills of the Methow Valley. But this year’s explosion of grasses and wildflowers is extraordinary — a literal rising from the ashes — for the valley that last July suffered the largest wildfire in Washington history. Because the massive Carlton Complex fire derailed special events and stifled tourism, the economic engine for the Methow in summer, valley businesses and residents are ready to welcome visitors this season. In the fire’s aftermath, there are two very different faces of the Methow Valley. Anyone arriving from Western Washington via the North Cascades Highway is likely to think, “Fire? What fire?” as Mike Lui, the U.S. Forest Service Methow District ranger, said recently. That’s because the 256,108-acre Carlton Complex fire didn’t burn the upper Methow Valley nor most places that attract visitors. All major roads are repaired, and all state parks, golf courses, campgrounds and trailheads are open on federal, state and private land. But visitors driving to the Methow from the south on Highway 153 from Pateros, Okanogan County, or from the east taking Highway 20 over Loup Loup Pass, will see a very different Methow. Fire-seared dead and drying trees stretch across the land, as do remnants of devastating mudslides that followed the massive fire. Empty spaces show where fire-destroyed homes and outbuildings once stood. Family, friends and outside volunteers continue to help each other repair and rebuild, clearing rubble, fixing fencing and constructing new houses. Tourists will find the building boom is most apparent in the hard-hit lower Methow Valley, where the highest percentage of the nearly 300 homes were lost in the lightning-caused wildfire. 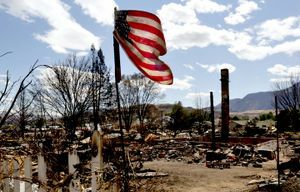 On July 17, pushed by strong winds, the wildfire raced many miles in several directions and roared all the way to Pateros on the Columbia River, devouring houses and vegetation. At its peak, the fire consumed 123,000 acres in nine hours — 3.8 acres per second. Overwhelmed local firefighters did what they could while waiting for help to arrive. Citizens faced down the firestorm with tractors, bulldozers, garden hoses and shovels. 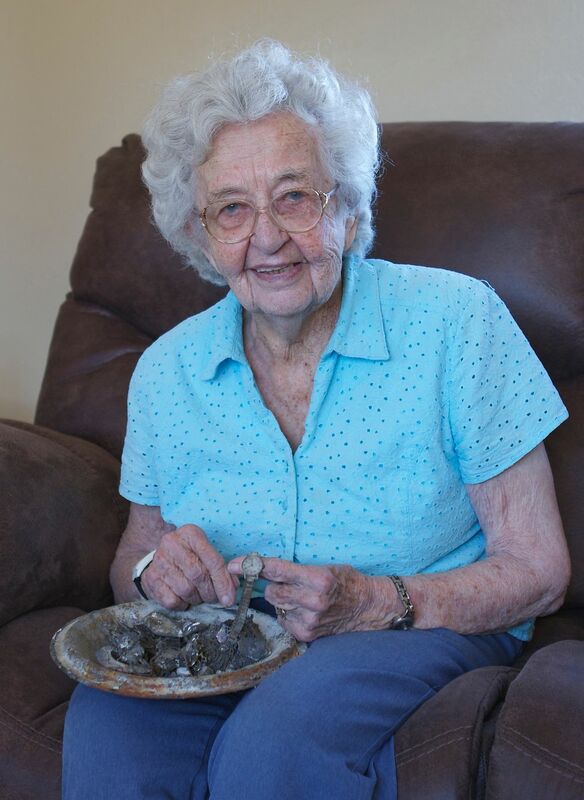 Cecelia Campbell, 94, is one of those who lost her home to the fires. She’s known to tourists as a self-taught painter of local landscapes who sells her artwork at the Saturday Farmers Market in Twisp. Campbell lives on a ranch up Beaver Creek that was in the path of what her son Bob called “a sleeper fire” that shot voraciously out of Pipestone Canyon. Thanks to granddaughters who grabbed some paintings off her wall as they fled, and the fact that she hadn’t unloaded her van from the previous week’s market, Campbell still has a few paintings. She lost the house she and her late husband built in 1943 on the ranch where they raised cattle, hay and their five kids. The fire took the oldest family photographs, the piano and organ, her grandmother’s china, the barns, about 3.5 miles of fencing. Nothing was insured. But with the help of family, friends and her own pioneer spirit, Campbell is resettled on her land in a used mobile home. The land burned by the Carlton Complex fire was about two-thirds public land under federal and state jurisdiction and one-third privately owned. 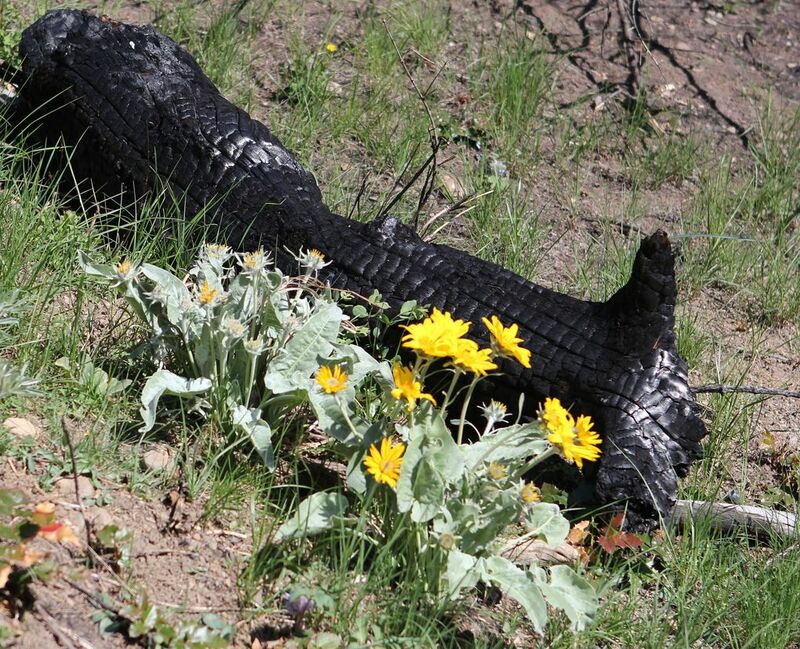 Native bunchgrass is regenerating quickly, and golden arrowleaf balsamroot, the valley’s signature wildflower, is among many species already blooming. But new forest will take 30 to 40 years to regenerate, said Bill Gaines, director of the Washington Conservation Science Institute. And it could take up to 50 years for the sagebrush to fully recover (about 70 percent of what burned was shrub-steppe habitat). Audra Sims, assistant park manager at the popular Alta Lake State Park, said, “The entire park is functional and rehabilitated” though some spots will be “sunnier than ever” because of lost trees. Loss of forest was the main impact, although new trees have been planted. Alta Lake has been stocked with fish for the season and anglers can expect “tons of fish” this year, said Sims, because the five-week park closure last year during the fire means the carry-over fish population is higher than normal. 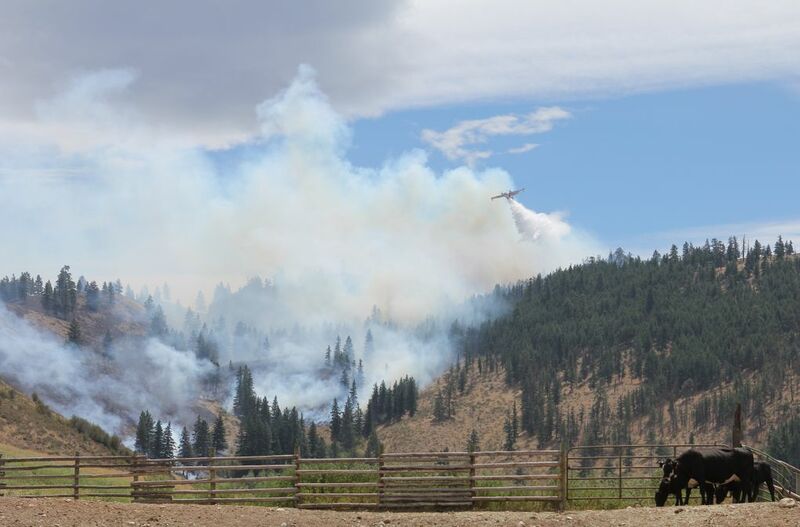 The wildfire never moved into the park, Lewis added, although campers and boaters were evacuated several times due to fire threats, a power outage and because helicopters and planes collected water from the lake for fighting the fires. The Methow is a mecca for mountain bikers, with dozens of miles of developed trails, including those near Sun Mountain Lodge, as well as backcountry routes. Three of the valley’s biking trails were in the burn zone, but only one, Lightning Creek, is considered damaged enough to avoid. Pipestone Canyon — popular with mountain bikers, hikers, runners and horseback riders — is largely burned out, but it is open and accessible from both ends of the canyon. Post-fire erosion had the biggest impact on the Pipestone Rim Trail, according to Julie Muyallaert, co-owner of Methow Cycle and Sport. The trail is ridable, just “not in as good a shape as it was,” she said. Finley Canyon is a popular spring and fall location for bikers. The upper canyon burned very hot and there are sandy washouts covering parts of the Lower Canyon Road. Muyallaert suggested a fat-tire bike would be best in some areas of Finley Canyon because of changed soil consistency. 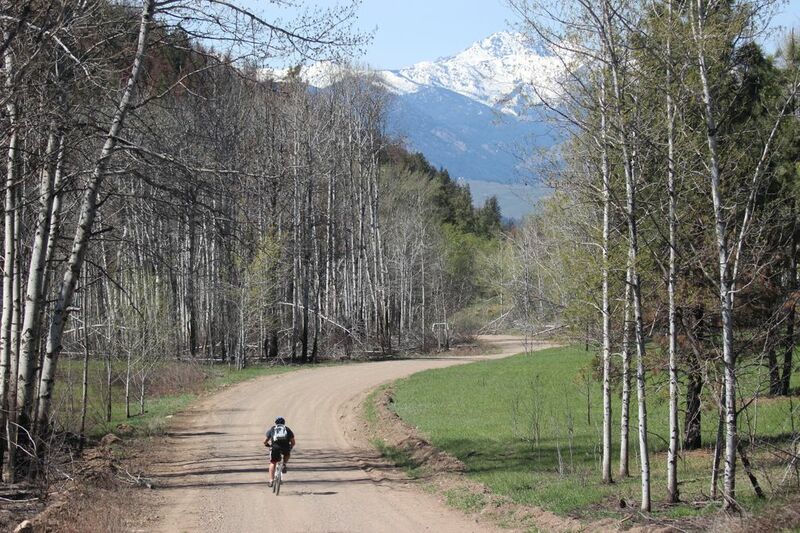 Lightning Creek is part of the 22-mile Starvation Mountain loop ride. A fire road was built over what had been a single-track bike trail. It’s not very well maintained at this point. All state Department of Natural Resources lands are open, as are the valley’s Washington Department of Fish & Wildlife lands. The 18-hole Alta Lake Golf Course adjacent to Alta Lake park is open daily and accommodations at the motel, which did not burn, already are 80 percent booked until September, said employee Karen Foutch. It was a “crazy fire,” Foutch said. The old clubhouse was destroyed along with the maintenance shed and 40 “pretty much new golf carts.” More than 50 homes in the community surrounding the course burned to the ground. Bear Creek Golf Course near Winthrop is open daily. The fire burned the hillside above the course across Bear Creek Road, but fire crews were able to hold the line. “I would discourage anyone from recreating in a burned area, especially on a windy day,” said Susan Prichard, a University of Washington researcher specializing in wildfire ecology who lives in the valley near Winthrop. Falling trees are a major safety hazard because any tree that was dead before the fire burns and smolders longer than wetter, live trees, she explained. Sometimes they burn through at the bottom but remain standing. “Look up and around for snags,” Prichard cautioned. They can randomly fall even on a calm day and can be disturbed by as little as a person walking by. Prichard recommends staying on established trails. Dead root systems can burn for a long time, creating underground hollows. Off-trail hikers might step into voids a foot or more in depth. Prichard and Zbyszewski both suggest that adventurous souls willing to follow common-sense precautions drive or bike along South Summit Road 41 to see upper Finley Canyon, one of the highest intensity burn areas. South Summit Road is a single-lane, paved road that intersects with Highway 20 at the summit of Loup Loup Pass. Turn around at the intersection with Forest Service Road 300, which is on the right, and return to the main highway. Avoid windy and rainy days because of falling trees or possible mud slides. Zbyszewski recommends letting somebody know where you’re going; taking a map, food and water; and carrying a saw in your vehicle in case the road gets blocked by a downed tree. Cellphone service is spotty in the area. If you ask, Methow Cycle and Sport offers a fire map and directs visitors to the Beaver Creek or Pipestone Canyon areas — with the request that visitors respect the land and residents’ privacy. Wildfire exhibit: New at the Methow Valley Interpretive Center (210 Fifth Ave., Twisp) is “Conflagration to Transformation,” with photos, maps and displays. Open 10 a.m.- 5 p.m. Saturday and noon- 5 p.m. Sunday. Starting in June, also open noon- 5 p.m. Friday. Karen M. West is a former Seattle Times editor who lives near Winthrop.